As many of you may have noticed, in mid-November the fence was brought down around Riley Park. Many community members have been starting to use the dynamic park space and are noticing the area where the Riley Park Community Garden will grow! We are finalizing our license agreement with the City of Vancouver and hope to be in the garden early in 2017 to mark out the garden site, lay pathways, and begin planting. We look forward to reaching out to you for the many volunteer work parties to come. With input from the Riley Park Community Garden Committee, we hired a Garden Coordinator on a 6-month contract to bring the past two years' work of consultations, designs, and planning to life and establish the garden space through winter and spring planting, construction, and community engagement. Join us at future work parties to meet Hannah, or contact her directly at info@rileyparkgarden.org. Happy holidays from all of us and we look forward to growing with you in the new year! January 7: recycle your Christmas tree and support the garden! To view the meeting minutes in full, click here. To view the timeline in full, click here. 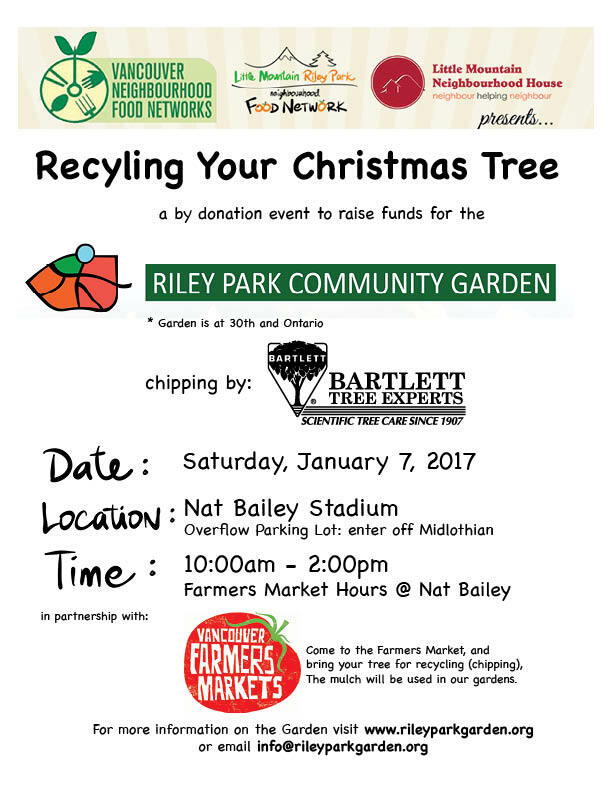 We are excited to invite you to a Christmas tree recycling event on Saturday January 7th, 2017 in partnership with Bartlett Tree Experts, who will be providing the tree chipping services, and Vancouver Farmers Markets, who will be hosting the first Nat Bailey Winter Farmers Market of 2017 that same day. The chipper will be set up in the market's overflow parking lot (just south of Nat Bailey Stadium) from 10AM-2PM and all are welcome to bring their trees for recycling. Donations will go towards the Riley Park Community Garden just across the street. Help us spread the word and tell your friends! We are overjoyed to share that we have secured a Neighbourhood Matching Fund from the City of Vancouver for The Serviceable Shed! The purpose is to build a garden shed of re-purposed wood and materials from local demolition sites combined with cob construction featuring functional environmentally-friendly and portable features to support and enhance program delivery in Riley Park Community Garden. A big thank-you to the City for their support and we look forward to taking this project forward in 2017. 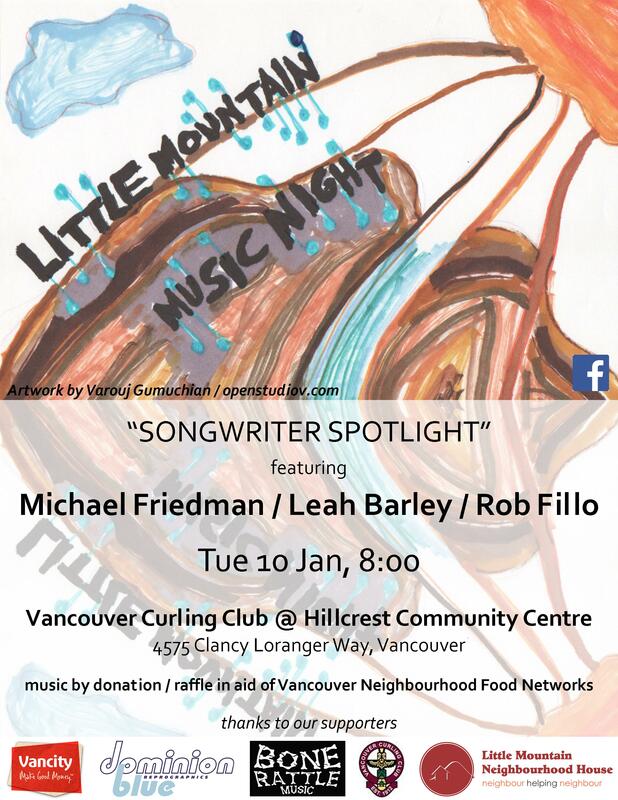 Join us at this community event to raise funds for the Vancouver Neighbourhood Food Networks, who support the work we do with the Riley Park Community Garden! We are looking forward to our next committee meeting on Thusday, January 19th, 2017. Location will be announced in early January. This meeting is open and we welcome any who are interested! A draft agenda for the meeting can be seen here and we are calling for any other agenda items people may have; please send them to info@rileyparkgarden.org. 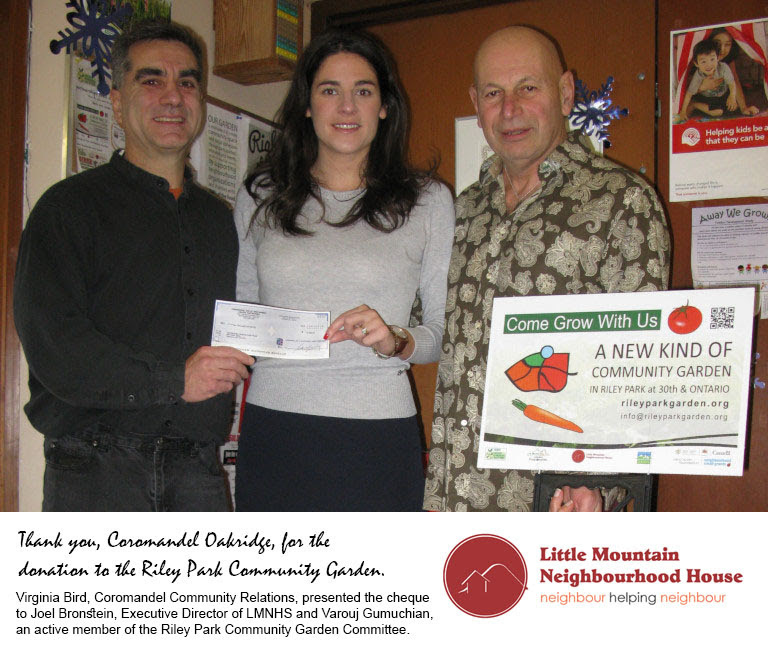 Thank you Coromandel Oakridge for the donation to the Riley Park Community Garden! For further information on our sponsorship package, email info@rileyparkgarden.org. Copyright © 2016 Riley Park Community Garden, All rights reserved.